Beautiful pink flamingos passing by camera and reflecting on surface of shallow freshwater pond. Flock of tall tropical birds walking in stagnant water covered with green algae. Cam stays still. Pair of sleepy white flamingos standing with their beaks under wings and taking nap near shallow pond covered by green algae. Resting beautiful exotic birds in stagnant water. Camera stays still. Elegant pink flamingo feeding in stagnant water covered by green algae. Tall exotic bird with long legs forages for food in shallow freshwater pond. Eating tropical animal concept. Camera stays still. 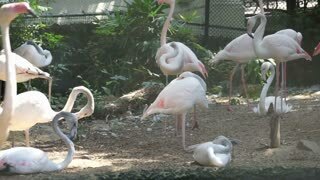 Graceful flamingos drinking and feeding in shallow pond. Tall wading birds with white and scarlet plumage, long legs and neck forage for food in water covered by green algae. Camera stays still. Gorgeous white flamingo chick walking in still green water of freshwater pond against pink adults passing by on background. Young offspring looking around. Flock of exotic birds in their habitat. Asian water Buffalo lying relaxed in freshwater pond, chewing and looking at camera. Exotic bovine bathing in water to keep cool. Udawalawe National Park, Sri Lanka. Long shot. Cam stays still. Flock of flamingos by the pond. Flock of hundreds birds at good feeding lake in South America. Flamingos seek algae and diatoms in shallow salty water.